Full Irish in bed? The Westbury’s Valentine’s package is the dream | SHEmazing! Ah Valentines Day – the one day of the year that smoochy PDAs are perfectly acceptable for the coupled-up, and singletons have free reign of the bars and clubs to celebrate their selective solitude in style. However, if you're loved-up and looking for the ideal romantic bonanza to treat your bae to on the big day, then look no further. 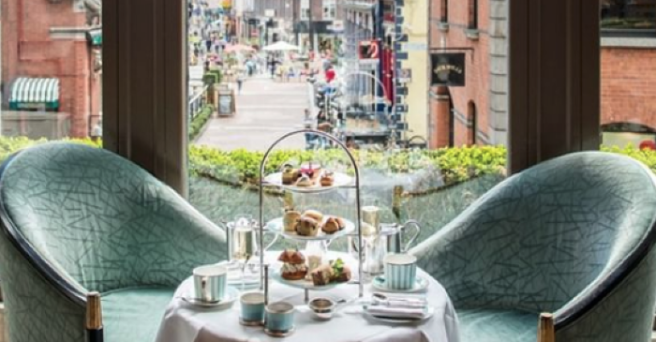 One of Dublin's boujiest hotels, The Westbury, is boasting a romantic Valentine's package that is all things rom-com worthy. The Westbury’s indulgent romance experience is the ideal retreat in the heart of the city, a stones throw from St Stephens Green (perfect for an after dinner romantic stroll?). The following morning guests will enjoy a delicious full Irish Breakfast in bed – complete with potato cake and pudding, we checked. The hotel is perfectly located by a stunning florists, Appassionata, where you can grab a fresh bouquet for your lover. It's also just around the corner from The National Gallery if you're romantic an art fan, or take to Grafton Street if your true love is more fond of retail therapy than critiquing post-modernism. The experience with The Westbury is available to book from €450 per room.